Just caught a glimpse John Hardy's new Kali multi-row chain bracelet...... I love the look of the chain and the contrast of the smooth organic Kali clasp. Kali means ‘river’ in Balinese and the water-smoothed stones that line the streams of Bali are the inspiration for the Kali Collection. Look at the detail inside the clasp...This is a must for me.....this will be a great addition to my endless collection of bracelets. It was Fashion Week in Hong Kong as I departed, I was sorry to miss it. Cuffs and bangles will continue to be a strong this season. They are here to stay..... There is nothing like having your favorites to throw on as part of the daily uniform. Rumor has it... 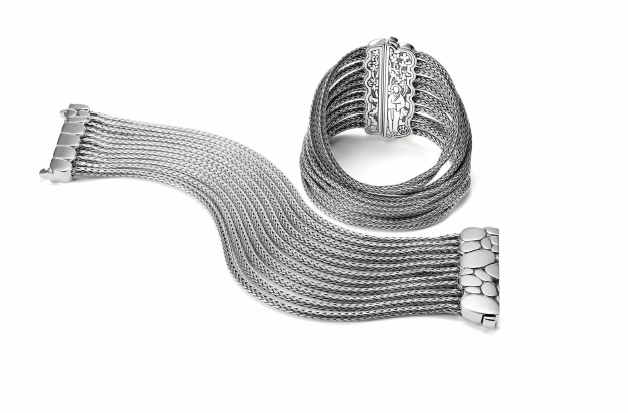 The John Hardy Fall 2010 is amazing...stay tuned! Love it the piece - especially the delicate mechanism of the clasp. The inside of the clasp is embellished with so much attention to detail that you want to wear it inside-out! Most of the John Hardy Designs (depending on the size) have this beautiful detail like the inside of this clasp....allowing every piece to tell a story. You are right you do want to wear it inside-out!